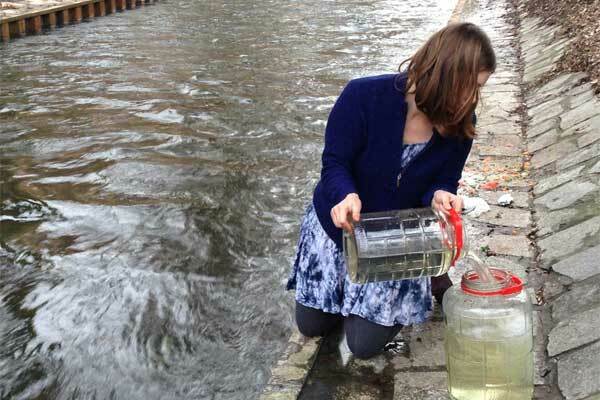 The research group DIY Hack the Panke, founded in January 2018, consists of a group of artists and scientists promoting Citizen Science projects along the Panke River in north and central Berlin. In the next few years the upper part of the Panke, in Berlin-Buch, will be re-wilded according to new EU standards, while the river's two points of entry into the Spree, currently underground, will be uncovered. DIY Hack the Panke is interested in these fluctuating areas and the effects of re-wilding, but our main area of focus is the Panke in Wedding and southern Pankow. This part of the river, known only a century ago as the 'Stinkpanke' because of pollution from nearby factories and tanneries, is now a popular urban green space sought after by local residents. Through interdisciplinary practice, the group aims to explore the Panke River for living organisms and critically examine its complex history of human use. Members of DIY Hack the Panke plan public workshops on topics such as river flora, fauna and microbiology; plastic waste and other pollutants; and the impact of history, culture and technology on the present-day Panke. In addition to workshops, the public is also invited to take part in a walks and talks as well as public labs to rediscover their urban environment, as well as learn and take part in Citizen Science. Beyond public participation in the research and connected events, results will eventually be returned to the public in the form of an online blog or website. A final publication in book form is also planned. Plastic has pervaded water, soil and our bodies. It is the new icon of our time. During the (Un)Real Ecologies: Microplastics workshop we will explore the presence of microplastics in the Panke River, near Art Laboratory Berlin. How do organisms and microorganisms exist with and construct with these human-made materials? We will interrogate the water samples, to discover a new understanding of the reality of the Panke's ecosystem, with plastic present and wholly a part of it - a microcosm that allows us to ask: "what is nature?" Please see individual project pages for more information.